The Kattegat (Danish: [ˈkadəɡad]; Swedish: Kattegatt, pronounced [²katːɛˌɡat]) is a 30,000 km2 (12,000 sq mi) sea area bounded by the Jutlandic peninsula in the west, the Danish Straits islands of Denmark to the south and the provinces of Västergötland, Scania, Halland and Bohuslän in Sweden in the east. The Baltic Sea drains into the Kattegat through the Danish Straits. 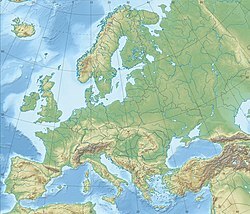 The sea area is a continuation of the Skagerrak and may be seen as a bay of the Baltic Sea or the North Sea or, as in traditional Scandinavian usage, neither of these. The Kattegat is a rather shallow sea and can be very difficult and dangerous to navigate, due to the many sandy and stony reefs and tricky currents that often shift. In modern times, artificial seabed channels have been dug, many reefs have been dredged by either sand pumping or stone fishing, and a well-developed light signaling network has been installed, to safeguard the very heavy international traffic of this small sea. There are several large cities and major ports in the Kattegat, including Gothenburg, Aarhus, Aalborg, Halmstad and Frederikshavn, mentioned by descending size. According to the definition established in a 1932 convention signed by Denmark, Norway and Sweden (registered in the League of Nations Treaty Series 1933–1934), the northern boundary between the Kattegat and Skagerrak is found at the northernmost point of Skagen on Jutland, while the southern boundary towards Øresund is found at the tip of Kullen Peninsula in Scania. Major waterways that drain into the Kattegat are the rivers of Göta älv at Gothenburg, together with the Lagan, Nissan, Ätran and Viskan in the province of Halland on the Swedish side, and the river of Gudenå in Jutland, in Denmark. The main islands of the Kattegat are Samsø, Læsø and Anholt; the latter two are, due to their relatively dry climate, situated in what is called "the Danish desert belt". A number of noteworthy coastal areas abut the Kattegat, including the Kullaberg Nature Reserve in Scania, Sweden, which contains a number of rare species and a scenic rocky shore, the town of Mölle, which has a picturesque harbour and views into the Kullaberg, and Skagen at the northern tip of Denmark. Since the 1950s, a bridge project usually referred to as Kattegatbroen (The Kattegat Bridge) connecting Jutland and Zealand across the Kattegat has been considered. Since the late 2000s, the project has seen a renewed interest from several influential politicians in Denmark. The bridge is usually envisioned as connecting Hov (a village south of Odder in the Aarhus area) with Samsø and Kalundborg. On the North: A line joining Skagen (The Skaw, northernmost point of Denmark) and Paternoster Skær (57°54′N 11°27′E﻿ / ﻿57.900°N 11.450°E﻿ / 57.900; 11.450) and thence northeastward through the shoals to Tjörn Island. In the Little Belt: A line joining Falshöft (54°47′N 9°57.5′E﻿ / ﻿54.783°N 9.9583°E﻿ / 54.783; 9.9583) and Vejsnæs Nakke (Ærö: 54°49′N 10°26′E﻿ / ﻿54.817°N 10.433°E﻿ / 54.817; 10.433). In the Great Belt: A line joining Gulstav (Southernmost extremity of Langeland Island) and Kappel Kirke (54°46′N 11°01′E﻿ / ﻿54.767°N 11.017°E﻿ / 54.767; 11.017) on the island of Laaland. In the Sound: A line joining Stevns Lighthouse (55°17′N 12°27′E﻿ / ﻿55.283°N 12.450°E﻿ / 55.283; 12.450) and Falsterbo Point (55°23′N 12°49′E﻿ / ﻿55.383°N 12.817°E﻿ / 55.383; 12.817). According to Den Store Danske Encyklopædi and Nudansk Ordbog, the name derives from the Dutch words kat (cat) and gat (hole, gate). It derives from late medieval navigation jargon, in which captains of the Hanseatic trading fleets would compare the Danish Straits to a hole so narrow that even a cat would have difficulty squeezing its way through, on account of the many reefs and shallow waters. At one point, the passable waters were a mere 3.84 km (2.39 mi) wide. The name of the Copenhagen street Kattesundet has a comparable etymological meaning, namely "narrow passage". An archaic name for both the Skagerrak and Kattegat was the Norwegian Sea or Jutland Sea (Knýtlinga saga mentions the name Jótlandshaf). Its ancient Latin name was Sinus Codanus. Control of the Kattegat, and access to it, have been important throughout the history of international seafaring. Until the completion of the Eider Canal in 1784, the Kattegat was the only sea route into and out of the Baltic region. Beginning in 1429 in the Middle Ages, the Danish royal family – and later the state of Denmark – prospered greatly from the Sound dues, a toll charged for passage through the Øresund, while Copenhagen provided shelter, trade and repair opportunities and protection from piracy. The dues were eventually lifted in 1857. In the Kattegat, the salinity has a pronounced two-layer structure. The upper layer has a salinity between 18‰ and 26‰ and the lower layer – separated by a strong halocline at around 15 m (49 ft) – has a salinity between 32‰ and 34‰. The lower layer consists of inflowing seawater from the Skagerrak, with a salinity on level with most other coastal seawaters, while the upper layer consists of inflowing seawater from the Baltic Sea and has a much lower salinity, comparable to brackish water, but still a great deal higher than the rest of the Baltic sea. These two opposing flows transport a net surplus of 475 km3 (114 cu mi) seawater from the Baltic to the Skagerrak every year. During stronger winds, the layers in the Kattegat are completely mixed in some places, such as the Great Belt, so the overall salinity is highly variable in this small sea. This sets some unique conditions for the sealife here. Cold seeps, locally known as bubbling reefs (Danish: boblerev), are found in the northern Kattegat. Unlike cold seeps in most other places (including the North Sea and Skagerrak), the Kattegat bubbling reefs are at relatively shallow depths, generally between 0 and 30 m (0–100 ft) below the surface. The seeps rely on methane deposited during the Eemian period and during calm weather the bubbles can sometimes be seen on the water surface. Carbonate cementation and lithification form slaps or pillars up to 4 m (13 ft) tall, and support a rich biodiversity. Because of their unique status, the Kattegat bubbling reefs receive a level of protection and are recognized as a Natura 2000 habitat (type 1180) by the European Union (EU). The Kattegat was one of the first marine dead zones to be noted in the 1970s, when scientists began studying how intensive industrial activities affected the natural world. In recent years, studies and research has provided much insight into processes like eutrophication, and how to deal with it. Denmark and the EU have initiated costly and far-reaching domestic projects in order to stop, repair and prevent these environmentally destructive and economically damaging processes, since the first Action Plan for the Aquatic Environment in 1985, and are now busy implementing the fourth Action Plan. The action plans sums up a broad range of initiatives and includes the so-called Nitrate Directives. The action plans have generally been viewed as a success, although the work is not finished and all goals are not completely met yet. Due to the very heavy sea traffic and many large coastal settlements, the Kattegat has been designated as a Sulphur Emission Control Area as part of the Baltic Sea since 2006. The benchmark for sulphur in fuels was recently lowered to 0.1%, to be effectuated from 1 January 2015. The Bay of Aalborg, comprising a 1,774 km2 (685 sq mi) shallow sea area. Anholt and the sea north of the island. The Nordre älv estuary north of Gothenburg. An important spot for migratory birds and fish. The Vrångö archipelago (Swedish: Vrångöskärgården), part of the Archipelago of Gothenburg. An important reproduction area for seabirds and seals. Kungsbacka Fjord. A shallow water fjord between Gothenburg and Varberg, including important salt marshes. There are several offshore windfarms in Kattegat. Some of the world's busiest shipping lanes pass through Kattegat. The larger shallow sand and stony reefs have been equipped with light signaling in modern times. There are several archipelagos in the Swedish part of Kattegat. The Swedish coasts in Kattegat are rocky shores, like this one in Kullaberg. All the Danish coasts in Kattegat are sandy beaches with no exposed bedrock. ^ Convention No 3210. League of Nations Treaty Series 139, 1933–1934. Retrieved 27 December 2012. ^ Rolf Ask Clausen (2 October 2007). "Ingeniøren 1955: Byg bro over Samsø [Build a bridge across Samsø]" (in Danish). Ingeniøren. Retrieved 16 February 2016. ^ "En fast Kattegatforbindelse". kattegatforbindelse.dk (in Danish). Kattegatkomitéen. Retrieved 15 May 2017. ^ "Limits of Oceans and Seas" (PDF) (3rd ed.). International Hydrographic Organization. 1953. Retrieved 6 February 2010. ^ a b Nudansk Ordbog (1993), 15th edition, 2nd reprint, Copenhagen: Politikens Forlag, entry Kattegat. Gilman, D. C.; Peck, H. T.; Colby, F. M., eds. (1905). "Cattegat, The" . New International Encyclopedia (1st ed.). New York: Dodd, Mead. ^ "Kattegat | strait, Denmark-Sweden". Encyclopedia Britannica. Retrieved 16 May 2017. ^ Matti Leppäranta nad Kai Myrberg (2009). Physical Oceanography of the Baltic Sea. Springer-Praxis. pp. 72–74. ISBN 9783540797036. Retrieved 30 January 2016. ^ a b c "Red List – Submarine structures made by leaking gases" (PDF). HELCOM. 2013. Retrieved 16 June 2017. ^ "Proposed measures for fisheries management in Natura 2000-sites in the Danish territorial area of the Kattegat and Samsø Belt" (PDF). Meeting at the AgriFish Agency, Copenhagen. Minister for Food, Agriculture and Fisheries (Denmark). 20 March 2012. Retrieved 16 June 2017. ^ "Further Rise in Number of Marine 'Dead Zones'". UNEP. 19 October 2006. Retrieved 30 January 2016. ^ Karleskint, Turner and Small (2013). Introduction to Marine Biology (4 ed.). Brooks/Cole. p. 4. ISBN 978-1285402222. Retrieved 30 January 2016. ^ Hagerman, Lars; Josefson, Alf B.; Jensen, Jørgen N. (1996). "Benthic macrofauna and demersal fish". Eutrophication in Coastal Marine Ecosystems. Coastal and Estuarine Studies. 52. pp. 155–178. doi:10.1029/CE052p0155. ISBN 978-0-87590-266-1. ^ Jesper H. Andersen; Jacob Carstensen (25 October 2011). "Action Plans for the Aquatic Environment have been a success". Politiken (in Danish). Retrieved 24 November 2014. ^ "New sulphur regulations may lead to distortion of competition in the shipping industry". MT Online. 12 August 2014. Retrieved 19 January 2016. ^ "Natura 2000" (in Danish). Danish Nature Agency. Retrieved 19 January 2016. ^ "Natura 2000" (in Swedish). Swedish Environmental Protection Agency. Retrieved 19 January 2016. "Cattegat" . Encyclopedia Americana. 1920. "Cattegat" . Collier's New Encyclopedia. 1921.